Are you a mythical warrior who's taken a bit too much battle damage recently? Buddy, have we got the elixir for you. Mana HEALTH Energy Potion is the ideal beverage for anyone who needs to stock up for a long night of gaming, partying, and of course, dragon-slaying. This particular tonic is sure to go down smooth, and has a tasty apple-cinnamon flavor that contains elements of ginseng, biotin, and elderberry (a fruit we heard your father smells of). 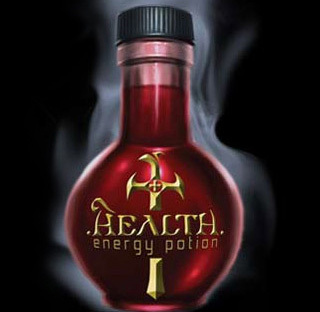 This particular bottle of Mana HEALTH Energy Potion is 50mL, and only contains 20 calories. Best of all, this bottle is made of plastic, so don't you worry your pretty little elven head that these suckers will break on delivery. Xoxide Zach says - I LOVE to drink our Health Energy Potion! Going through the Xoxide dungeon filled with Ubern00bs, CyberChickens and Stinky Spiders you can loose alot of XP and health. Only one health potion and I am ready to fight again and again!